A gorgeously green garden with a poolside vibe is the stuff that design dreams are made of. But many of us make the mistake of thinking that a small pool in a small garden is not really possible. However, a team of experienced designers will tell you otherwise! Even a diminutive outdoor space can house a swimming pool, creating a little oasis from an unused terrace or small backyard. 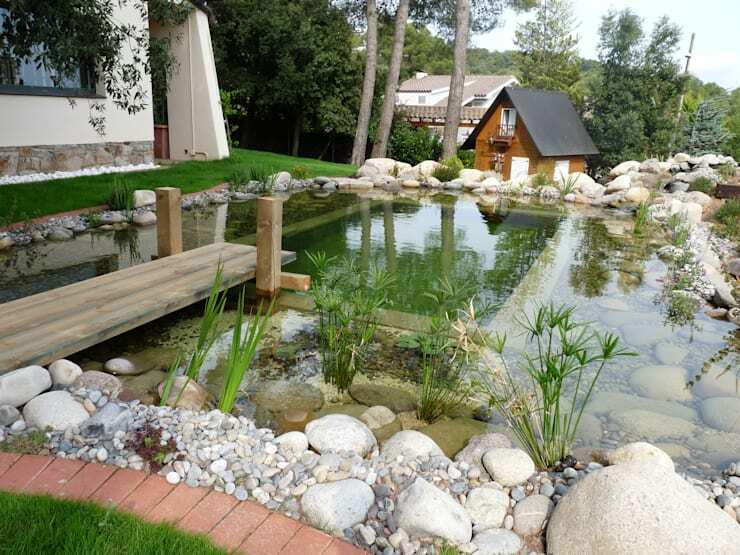 So let's take a look at some swimming pools that are perfect for small gardens, and get some amazing inspiration to fill your compact green space! 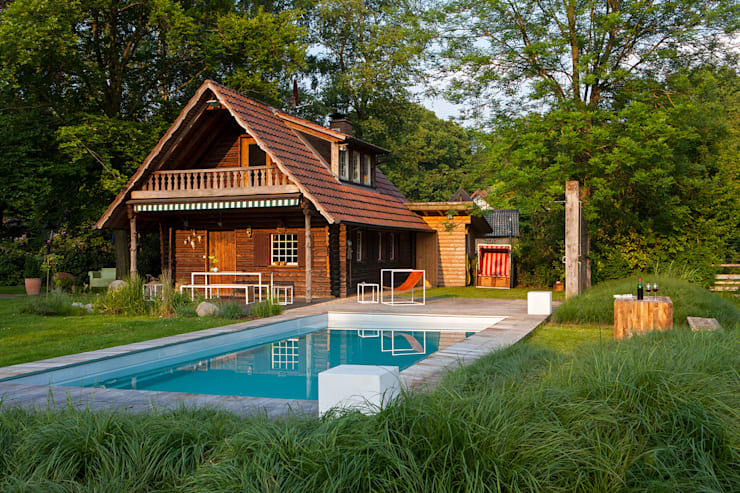 This country home is set in the deep woods with a pretty chalet-like aesthetic. The wooden exterior of the home and the greenery around had only one thing missing: some pristine blue goodness! The swimming pool here is the perfect addition, blending beautifully into its green surroundings and leaving plenty of space for other outdoor activities. This beautiful pool has been fashioned like a pond, and will transport you straight to rugged Mediterranean shores or Japanese lakes. The rocks lining this pool, as well as the repurposed wooden jetty, create just the right ambience in this small garden. This jungle setting makes the perfect romantic spot. 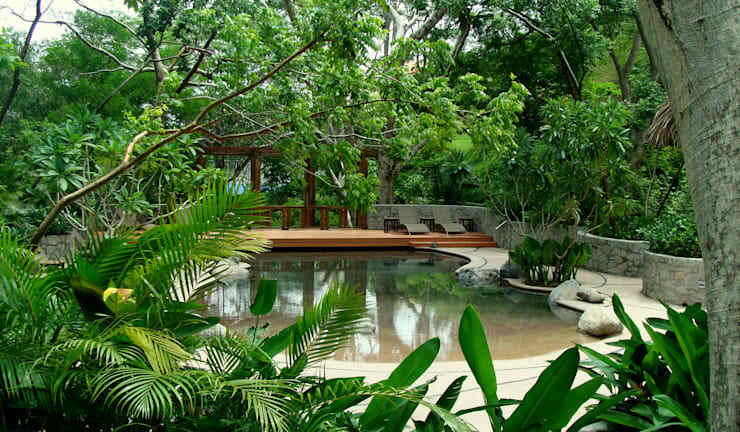 The tropical vegetation and dense shrubbery around the curving sandstone pool are the perfect pairing. A wooden deck lined with pergolas will entice you to sit back with a long drink for some unhindered me time! 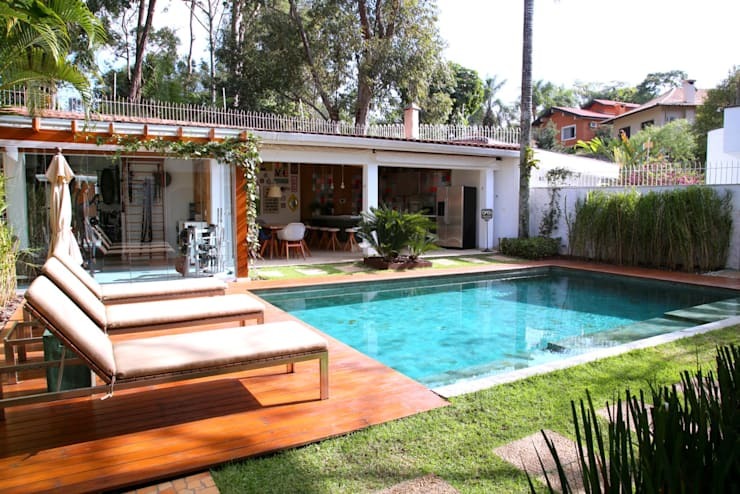 This cool pool may be small, but it makes a big statement! 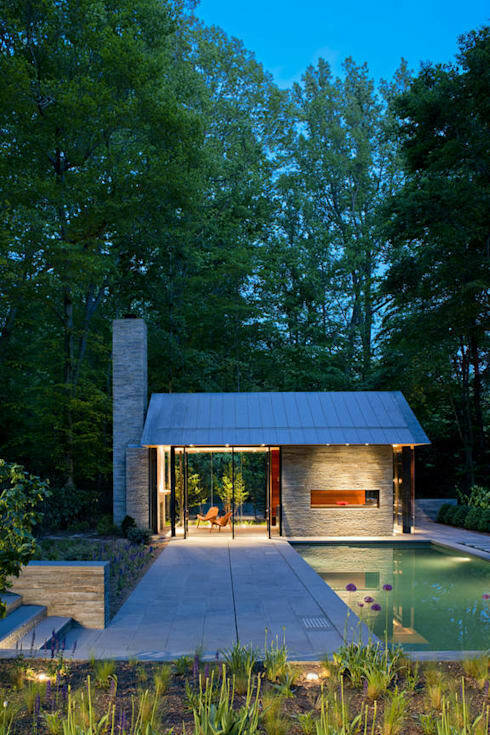 The linear form of the accompanying house and pergola creates a smart modern look, while a neat and polished wooden deck around the pool invites lazy summer evenings spent with a book. The designers have allowed the greenery to spill onto the sides for a natural feel. This minimalist-style home has glass walls on one side and exposed concrete walls on the other side. The pool reflects this design scheme with its simple style, while concrete tiles and stylish planters complete the contemporary yet classic look. Inspired to start thinking of your own pool? For more gorgeous living ideas, take a peek at: 5 perfect small homes: inside and out! Which of these pools would you pick for your garden?